You need to supply your own corn for popping, oil, salt and/or sugar. We have bags available on sale or return. We recommend that you do a risk assessment before using the Popcorn machine. 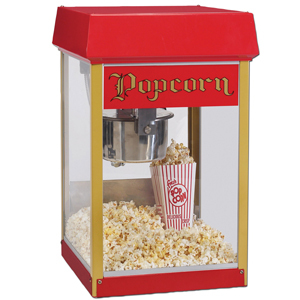 We have a sample that you can download at: Popcorn Machine Risk Assessment (PDF) or Popcorn Machine Sample Risk Assessment (Word). W: 40cm, D: 43cm, H: 61cm The machine is heavy and awkward. You will need two people to carry it. A car to transport it. A trolley is NOT suitable. Two people to collect and return it.